I have invested a great deal of time in The Book Thief. Asked to read the best-selling book by my beautiful other half, I have ploughed my way through it in order to not only please her but ready myself for the movie. So I went in with very high expectations as the book is a lovingly crafted tale of life in a small town in Germany during World War 2, as told by death. It’s shocking, fascinating and emotionally draining. The film, however, doesn’t deliver any of those things. In fact, it feels very watered down. 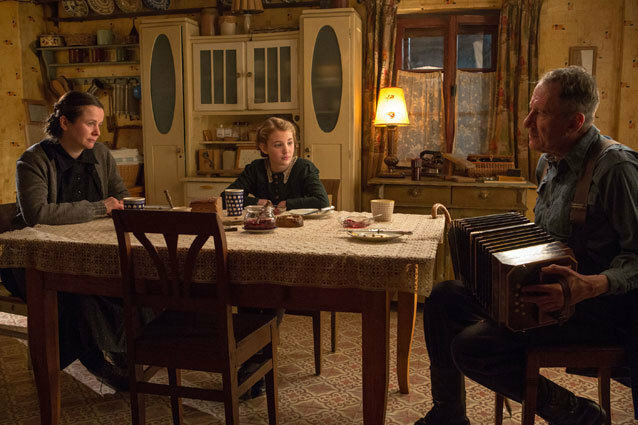 Liesel Meminger is a young girl who is fostered by Hans and Rosa Huberman, after her mother abandons her and her baby brother dies. She, at first, finds life hard and not being able to read or write, she becomes the victim of bullying at school. She befriends a young boy, Rudy and Hans slowly starts to teach her to read. Then the war begins, the Nazis are book burning and Liesel has to cope with the changing world, the arrival of a young Jewish man, Max, who goes into hiding in the Huberman’s basement and her obsession with books, leading her to steal them from the local Mayor’s library. All the time the feeling of doom hangs over them and death is never far. This is a very handsome looking film. The production values, from the sets and costumes to the cinematography, are all incredibly high. You cannot ignore the beauty of the piece. Director Brian Percival has aimed to give the viewer a sense of period and time as well as please the eye, which he certainly succeeds in. He also has an excellent cast to bring the characters to life. Only one man can bring Hans to the screen and in Geoffrey Rush, he hits the nail on the head perfectly. Gentle, caring and with that twinkle in his eye for mischief, Rush has that kindness etched across his face that you know, if you were sent to him to be looked after, you would feel safe. As Rosa, Emily Watson gives the part the hardness that is needed while at the same time, behind those blue eyes, is a woman who cares. I wasn’t sure about Watson’s casting but she manages to pull it off. What the film really hinges on is Liesel and Sophie Nielsse carries the film brilliantly. Her big blue eyes are constantly full of wonder and fear and she never once crosses into the realm of “drama school kid”, instead going for subtly and quite confidence. Then there is Death. As I said earlier, the book is narrated by the grim reaper and having the rich, deep tones of Roger Allam is a stroke of genius. Mixing great British theatrics with a crisp resonant tone gives it a sense of authority and tenderness. Here lies one of the film’s many problems. Death is an intricate part of the story telling and yet here, he pops in an out throughout but there are long moments when you completely forget his existence. This is a story about Death and how he follows this young girl as a sort of protector in a world where many are dying. Yet you don’t get that feeling at all. In fact, the film lacks any form of dread at all. It all feels very…safe. This is a time where the children are being brainwashed, where neighbours can be enemies in the blink of an eye, where the people, who once had comfortable lives are now struggling to make ends meet. Yet we don’t get any of this from the film. The arrival of Max, the Jewish man who Hans and Rosa take in, leaves them almost paranoid with fear that someone will discover him but here he isn’t given long enough to evoke anything. It is always difficult to transfer complex novels to the screen without upset the fans of the book but what we have here is a film that has taken key points but forgotten what the book is really about and so it lacks any sense of emotional punch. We witness the growth of a young girl but what about the destruction of a community? All the true horrors of the situations they face have been removed, probably not to upset or offend. It also has an ending that is wrong in so many ways, set up so the audience will sob their hearts out. The problem being, there should have been some emotional connection before that and what we get is pure cheese. It would have been interesting to have seen the film without reading the book and taken judgement then but I’m guessing that those who aren’t familiar with the story will be somewhat confused and maybe a little bored. It is a book that demands a screen version but alas, this is not it. Great performances, grand looking but lacking any real conviction, any emotional connection. A wasted opportunity.